National nonprofit PowerMyLearning earlier this week announced it has raised more than $6.5 million in grant funding to further develop its free, web-based personalized learning platform. 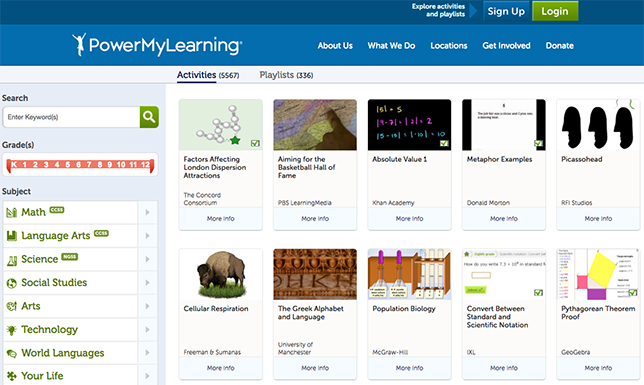 The PowerMyLearning Connect platform has free activities for all K–12 subjects aligned to Common Core and Next Generation Science Standards. Educators can choose a playlist or create their own by mixing and matching digital content like games, videos, tools and more. Using the platform, educators can build classes; customize assignments and activities; create customized assessments, and monitor learning with reports that track student activity on the platform. Among the investors for the most recent round of funding is the Bill & Melinda Gates Foundation, which provided $4.5 million. An additional $1 million apiece came from the Oak Foundation and the Carnegie Corporation of New York. PowerMyLearning plans to use the grants to create a delivery model to help expand personalized learning in public schools. It will also use funding to develop “rigorous student-facing playlists featuring a sequence of open third-party digital content –– such as games, interactives, videos and simulations –– combined with questions to assess learning,” according to the nonprofit’s growth plan. Additionally, PowerMyLearning will create teacher-facing playlists “designed to build teachers’ capacity for personalized learning.” The overall goal for the next five years, according to the nonprofit, is to reach more than 10,000 students annually. Further information is available on the PowerMyLearning site.